Angora rabbits and their cousins, the Jersey Woolly and The American Fuzzy Lop, grow wool instead of "normal" rabbit fur. Grooming an angora rabbit regularly will lower the chance of your pet ingesting wool and help keep dander and allergens to a minimum. Although angora rabbit breeds are docile by nature, coat care is complex. Few children will be able to take on the care of Angoras without the involvement of an adult. If your angora rabbit is a family pet or used for wool production, all you will need is a wide-toothed comb and a slicker brush. If you intend to show your rabbit, you’ll also need a high-speed groomer’s blower. Blowers can be expensive, but if angora showing is your hobby, then you won’t be able to get away without using one. Grooming can be done on a secure, waist-high table with a non-slip pad or carpet placed on the top. Unless you are using a blower on a coat, though, you may find it easiest to groom rabbits on your lap. First, put a towel down on your lap for flying fur as well as the rabbit’s security. Place the rabbit on your lap facing away from your body. If you’re right-handed, take a handful of wool into your left hand and firmly, but gently, pull straight up. With your right hand use the slicker brush to grab at the bottom of the grasped coat, then taking just a little bit of fur, brush the fur away from the body. Repeat that action, but this time grabbing a little more fur than the first time. Then repeat. Make sure you rotate the rabbit into a comfortable position for the section you’re grooming at that time. For places where there’s a little matting, use the wide-toothed comb and then go over it with the slicker brush. Pay special attention to under the chin, between the ears, and the side “furnishings” (the long hair on the sides of the cheeks). 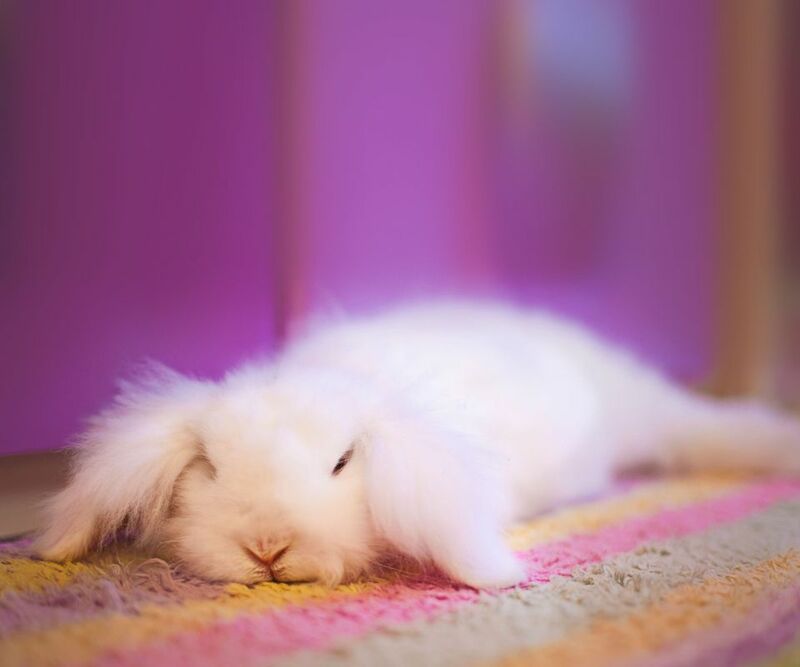 Furnishings can become matted if a rabbit is eating out of crocks. For the abdomen, you’ll need to carefully turn the rabbit over by gently but firmly holding onto the ears and the scruff (loose skin) of the neck at the same time. Place the rabbit’s ears between your knees, but be careful not to pinch them. Also, watch where your face is while you’re leaning over the upside-down rabbit grooming. They're notorious for kicking and will hit you in the face with their toenails. If you’re grooming a rabbit to keep it prepared for a show, you’ll need to break out the groomer’s blower. This blower is strong enough to force out the beginnings of what would be future mats (called “webs”) and blow it up through the hair shafts until it comes to rest on the top of the wool where it's easily pulled off. The blower's job is to work the coat like a forceful hairbrush, but it doesn’t rip out extra wool the way just using a slicker brush or comb can do. This is important if you’re showing your Angora because you don’t want to take out the all-important “density” of the coat. In a pinch, the cool setting on a good regular hairdryer will do. The force isn’t as powerful; therefore, the results won’t be as good, but it’s still useful. A blower is used the same way that you use the slicker brush in that you work with small sections at a time to get the job done. While the blower is on, you’ll notice very fine dander flying out. The white stuff blows everywhere (as well as all over the groomer) so plan ahead when you choose your grooming spot. Remember, the more the rabbit is groomed, the less dander it produces. After the rabbit’s coat has been blown out, you can very gently take the slicker brush and run it across the top of the coat with short strokes to remove the webbing that has been pushed out to the tips of the fur. Use the blower on the rabbit a couple of times a week to keep it in optimal condition. Most show angoras have been introduced to a blower as young bunnies, so don’t be afraid to turn the blower on around them. Even if they are new to it, they will quickly adjust to the sound and sensation.